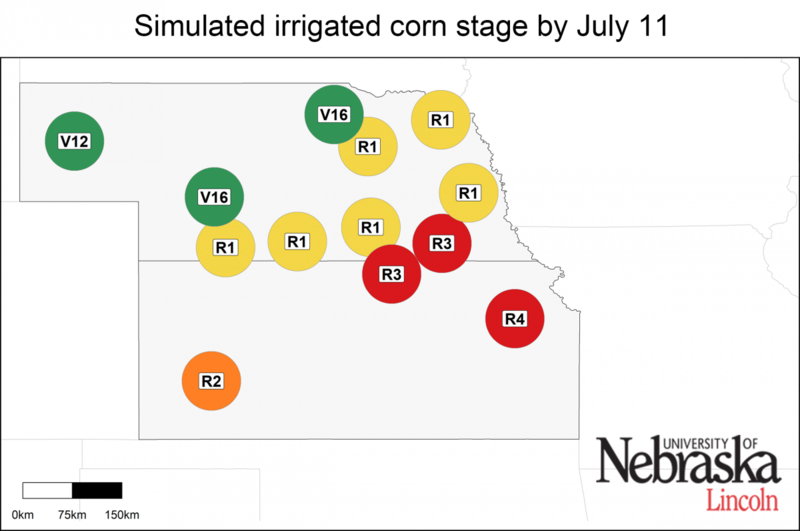 Simulations of 2018 end-of-season corn yield potential and real-time crop stage were performed on July 11 for 41 locations across the US Corn Belt using the UNL Hybrid-Maize crop model in collaboration with faculty and extension educators from 10 universities. This article summarizes the simulated crop stages and yield forecasts; the data can be downloaded here. Details on the UNL Hybrid-Maize crop model and the underpinning methodology to simulate phenology and forecast end-of-season yields, as well as on interpretation and uses of yield forecasts, are described in a previous article. A summary of weather conditions during the last 60 days (from May 12 to July 11) is shown in Figure 1. The season started with warm conditions throughout the Corn Belt, with air temperature averaging 4°F above normal. In contrast, rainfall was more erratic, with most locations exhibiting near or above normal records, except for sites in Michigan, Missouri, and Kansas with below-normal rainfall. Corn has reached silking in most parts of the Corn Belt, except for the northern fringe of the region where corn is still in the vegetative stage (North Dakota, Minnesota, Michigan, northern and western Nebraska, and a few scattered locations in northern Iowa, Indiana, and Ohio). Sites in the southern fringe of the region (Missouri, Kansas, and southern Illinois) are well ahead of the rest of the locations and are already in the grain-filling stage (Figure 2). Figure 1. Daily solar radiation, maximum and minimum air temperature (Tmax and Tmin), total rainfall, and total reference grass-based evapotranspiration (ET) for the period between May 12 and July 11, 2018. 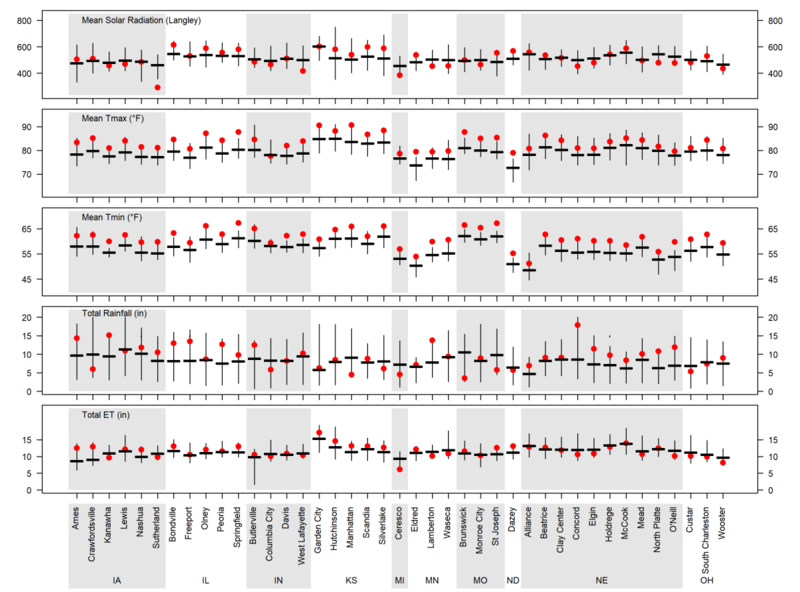 Vertical bars indicate the range for these variables based on 20+ years of weather records. The horizontal thick line indicates the long-term average and the red dots indicate the 2018 values. Vn: vegetative stage (nth leaf), R1: silking; R2: blister; R3: milk; R4: dough. The range of forecasted irrigated corn yield potential for each location, as well as the probabilities for yields above, near, or below average, are shown in Figures 3 and 4. It is still too early to visualize clear trends, though there is a relatively high probability of near-average yields for all sites (and even above-average yields for the sites in western Nebraska). 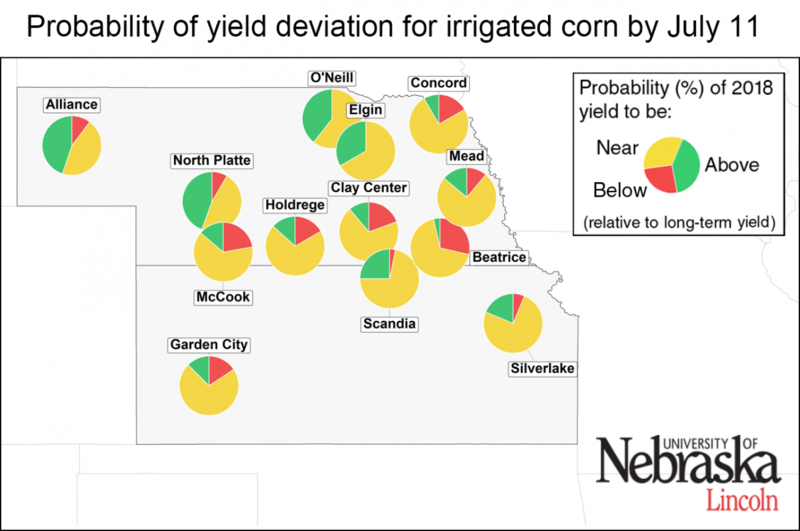 Weather conditions during the rest of the growing season will determine if most irrigated sites will have near-average yield potential. The chance of below-average yield appears to be small for all irrigated sites but one (Beatrice, Nebraska). Figure 3. Vertical lines indicate the range of forecasted 2018 corn yield potential by July 11 based on average planting date in 2018 at each location. Horizontal lines indicate the 25th and 75th percentiles of the yield distribution (associated with respective adverse and favorable weather scenarios during the rest of the season). The blue squares indicates the long-term (2005-2017) average yield potential at each location. Separate charts are shown for irrigated corn and rainfed corn. Figure 4. Probability of the 2018 yield potential to be below (<10%, red color), near (± 10%, yellow color), and above (>10%, green color) the long-term (2005-2017) average yield potential at each location. Separate maps are shown for irrigated corn (top) and rainfed corn (bottom). The larger a color section is within the pie chart, the higher the probability that end-of-season corn yield will be in that category. Forecasted yield potential is highly variable across rainfed sites (Figures 3 and 4). There is a high probability of above-average yield (>75%, that is, a chance of three out of four) at eight sites in northeastern Nebraska, southern Minnesota, southwestern Iowa, central Illinois, and Michigan. 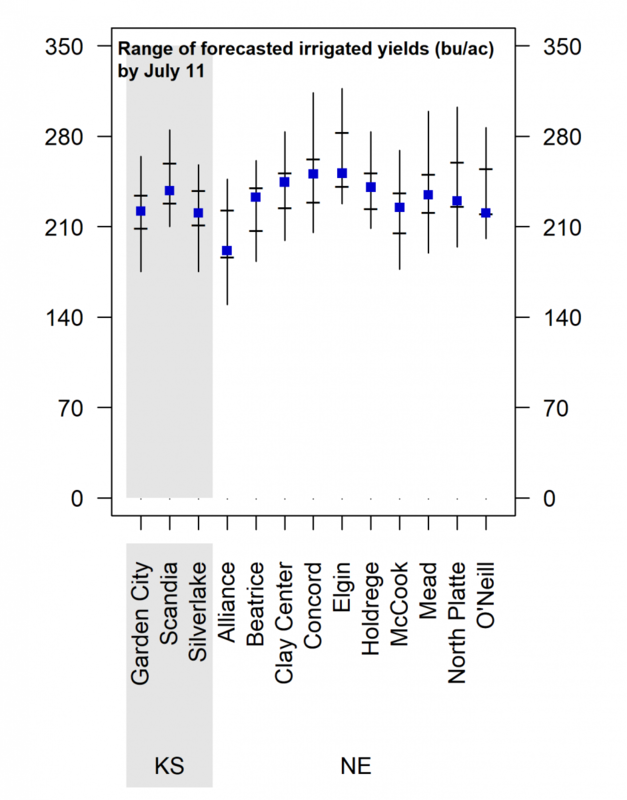 In contrast, there is a high probability of below-average yield for four sites along a transect that includes northeastern Kansas and portions of northern Missouri, and for the North Dakota site. Near-average yields are likely in central Iowa. The scenario is less clear for the other rainfed sites. Corn development is well ahead of normal, with most sites in the central and southern fringes of the Corn Belt in the silking or grain-filling stages. 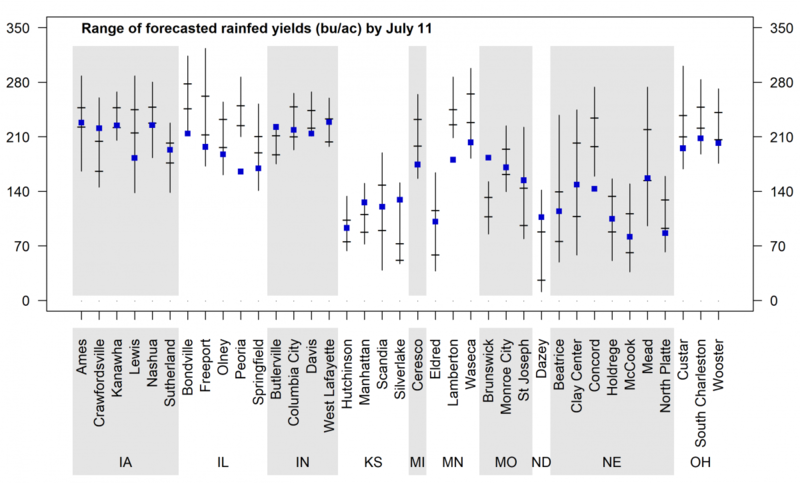 Although it is still too early to make strong inferences about end-of-season yields for irrigated corn, there is a relatively high probability for near-average yields for a majority of the sites. This can change depending upon temperature during the next two to three weeks. 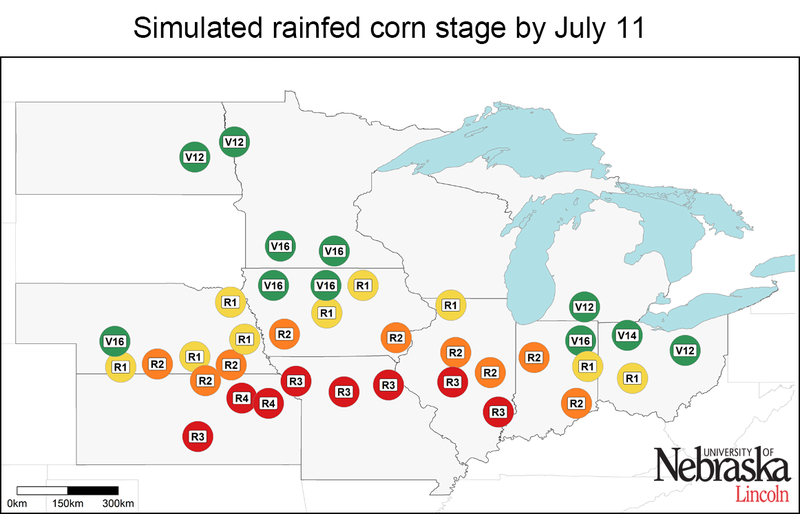 For rainfed corn, the scenario is diverse across regions, with above-average yields expected for northeastern Nebraska, southern Minnesota, southwestern Iowa, central Illinois, and Michigan, and below-average yields expected for four locations in the southern fringe of the region and the site in North Dakota. Temperature and rainfall during the rest of July and early August will likely determine the trend for the other rainfed sites. These forecasts do not take into consideration problems with stand emergence, hail/flooding damage, replanting situations, disease, or nitrate leaching. In fields negatively affected by these constraints, actual yields will be lower than estimates provided here. 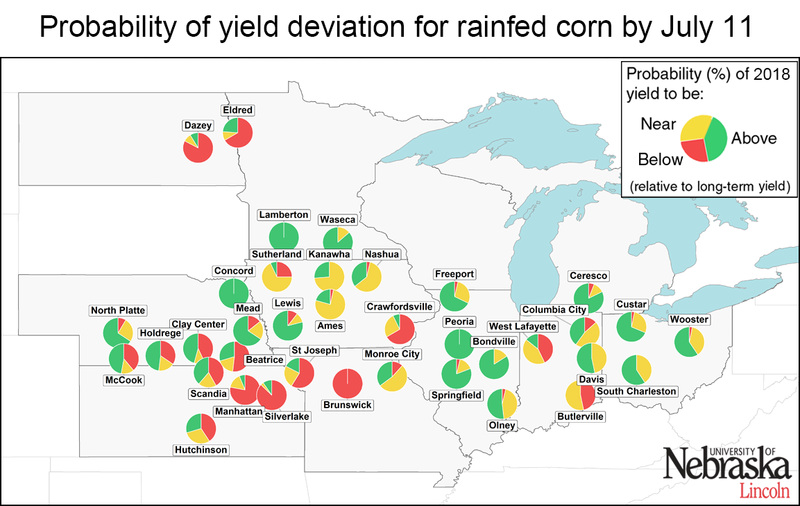 It is important to keep in mind that yield forecasts are not field specific and, instead, represent an estimate of average on-farm yield for a given location and surrounding area in absence of the yield-reducing factors mentioned here. Likewise, crop stages and forecasted yields will deviate from the ones reported here in fields with planting dates or hybrid maturities that differ markedly from those used as the basis for the forecasts. We will follow up with further forecasts in early August.